Playing dog training games is one of the best ways to teach your dog useful skills (like impulse control) and bond with your dog. You might remember our popular post on impulse control games, but it’s time for a bit of an update. We’ll include some of the old favorites in this post on dog training games, but we’re not limiting this post to just impulse control. If you’re really struggling with your dog’s impulse control, check out our online dog training courses. There’s something there for everyone! Without further ado, let’s explore some of the best dog training games known to man’s best friend. I didn’t invent any of these games, so I’ll try to give credit where it’s due. Pioneered by the great Sophia Yin, this game teaches your dog to ignore distractions while on walks. Have your dog on leash. Toss a treat out of his reach. Wait for your dog to stop pulling and straining towards the treat. When he does, give him a treat for looking at you. Only then can you walk towards the treat. Be sure to keep a loose leash while you do so. As you go, you’ll start noticing that your dog automatically will not pull you towards tempting items on walks. Practice in a variety of locations with a variety of temptations to solidify the skill. A favorite of Susan Garrett, this game teaches dogs to ignore dropped food in the home. If you do it enough, your dog will learn to automatically wait for permission to take food. When she stays away for a second or two, place 1 treat on the ground. Gradually build up time between opening your hand and delivering the treat so that your dog has to watch the open hand for longer. “Level up” this game by putting the food on the floor and covering it with your hand, then by covering it with your foot. You can add the cue “leave it” right before you open your hand if you want. Pick out a blanket, towel, or mat. This should not be a dog bed. Reward your dog for any interest in the mat – looking at it, moving towards it, sniffing, paws on it. Keep treating your dog if she stays on the mat. Gradually narrow your criteria. Work towards only rewarding your dog for lying down. It’s ok to just cut to the chase and cue your dog to lie down, if you’d like. I absolutely swear by this training method. Thanks to Karen Overall’s relaxation protocol, I’ve taught my high-energy border collie to lie at my feet for up to 8 hours a day while at a busy coworking space. Don’t worry, we get up for plenty of walks and potty breaks! This is a new one for me. SMART x 50 was invented by Kathy Sdao and was brought to my attention by Sarah Stremming’s podcast. This dog training game focuses on teaching your dog basic life skills and manners around the house. SMART stands for See, Mark, and Reward Training. Put 50 treats (or pieces of your dog’s dinner kibble) in a jar or treat pouch. Pay attention to your dog while you’re getting ready for the day, prepping dinner, or relaxing in the evening. Don’t prompt or cue him to do anything specific. When your dog does something you like (sitting, lying down, looking up at you before going through a door, choosing to ignore the cat), say “good boy” and toss him a treat. Repeat until all of the treats are gone. I love this dog training game for a few reasons. First, it helps you capitalize on the good behaviors your dog already offers. Second, it helps you recognize your dog’s good behavior. Third, it’s manageable even in a busy household. I wrote a whole blog about SMART x 50 if you’re interested in learning more! Teach your dog polite leash walking skills without treats (though treats certainly make things go faster). Pair this with U-Turns (number 13) for best results. Have your dog on leash. I like to use a dog’s flat buckle collar for this exercise. Do your normal walks on a harness in the meantime. Start walking forward. When your dog his the end of his leash and pulls, stop and wait. Don’t tug on the leash. Wait for a “J” to appear in your leash. Mark with a word (“good” or “yes” often works). Head off resource guarding and teach your dog to “drop it” with this handy dog training game! Don’t play this game without help from a trainer if your dog already has issues with sharing (or resource guarding). Give your dog something he likes. Try a stuffed Kong, chew toy, tug toy, pig’s ear, or ball. Approach your dog and click when he looks at you. Toss some awesome treats near him. He should drop it now! (If he doesn’t, you need better treats and a less exciting toy). Pick up the object he had as he eats the new goodies. Give him the object back. Repeat. The goal is that he gets excited for new goodies when you approach him. Repeat until your dog drops his toy when you come near. Now start offering your hand and saying “drop it.” You just added in a cue! If your dog is already showing some issues with sharing (commonly called resource guarding), set up a quick appointment with me before trying this game. There are some better ways to teach your dog to share if your dog already has issues. Teach your dog to calmly notice exciting, scary, or distracting things. This game is great for leash reactive and aggressive dogs when done right. If your dog struggles with any of these behaviors, give me a call. I can help you set up a full-fledged training plan to achieve your goals. Take treats on a walk with you. When you see the object of focus (a person, dog car, or squirrel), click or say “yes!” and feed your dog a treat when he looks back at you. If your dog doesn’t turn towards you because he’s too fixated on the object of focus, you’re too close or your treats aren’t good enough. Try again next time. Move away from the object of focus. 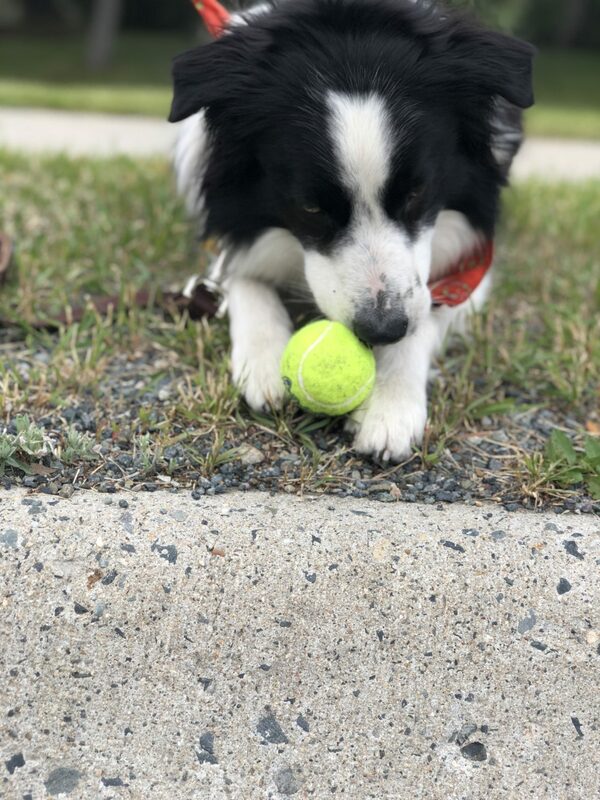 Keep playing the game on walks and you’ll quickly see that your dog is automatically looking from you to the object and back again, looking for a treat. This “autowatch” behavior is the end goal! This technique works really well to help the dog process the environment and learn to handle distractions. 1-2-3 walking is one of the Pattern Games developed by Leslie McDevitt. Have some treats in your pocket or treat pouch, but don’t lure your dog around with the treats. Right when you say “three”, give your pup a treat. Start out just delivering treats right to your pup’s mouth until he gets it that treats come when you say three. Then start to give the treat right next to the pocket or seam of your pants at head height for your dog. Keep your hand touching your leg so that you give the treat nice and close. This helps train your dog to stay super close to you. This game is a great way to build your dog’s love of “come when called,” exercise her nose, and play around on rainy days. Start by simply hiding behind a door or in another room (make it easy), then call your dog. When she eventually finds you, give her a huge reward with treats or toys. If she’s really struggling, call her again — but don’t make continuous noise. Gradually build up the difficulty of where you hide around the house. You can eventually play this game outdoors as a really fun way to build up speed and joy when you call your dog to you. It turns “come” into a game for your dog! I also merge this game with #10, “Go Find It” by teaching dogs to go find a specific person in the family (using the techniques below). Then you can have the person hide with treats or toys and reward your dog for finding them. Teach your dog to go find a specific toy. This game works especially well with dogs that love playing with toys. Start with just one toy out. Tell your dog to “go get your X” or “go find X.” Whatever phrase you pick, be consistent. Reward your dog by grabbing the toy by playing with it. If you say your cue in an excited voice and point at the toy, most dogs will get this right away. Fade out pointing and just use the verbal cue. Continue to reward your dog by playing with the toy when they grab it. Introduce another toy to the picture. You might want to start with another toy that’s a bit less excited than the named toy. Now, only reward your dog when he grabs the correct toy. Start to name a second toy using steps one and two. This will be easiest if your dog loves both toys about the same. If your dog goes bonkers for the ball and is kind of “meh” about a squeaky toy, don’t try to use those two toys! That sets you up for failure. Repeat step three with the two named toys. Start to alternate which toy you ask for. Gradually build up the number of toys that your dog knows by name. This game is a great mental and physical puzzle for dogs that love toys. It’s also a good way to wear out your dog if the weather is bad outside and you need to get out some energy! This is one of my all-time favorite games to play with my dog. This tug-based game teaches your dog to drop toys on cue and follow cues when he’s really excited. This is a great way to teach your dog to listen to you in distracting environments. Ensure that your dog is rock-solid with a cue or two. At the minimum, your dog needs to know how to play tug, how to drop a toy on cue, and how to do one more behavior. Start to play tug with your dog. Just play lightly at first — you don’t want to get your dog super riled up. Cue your dog to drop the toy. Cue your dog to sit, lie down, touch, or whatever other cue he knows really well. Reward your dog for listening by restarting the game. Intermittently just re-start the game when your dog drops the toy. Repeat. If possible, mix in different cues to make your dog really think. Gradually increase the intensity of your tug game — but if your dog ever stops being able to listen, reduce the intensity level and try again. You can also play this game with a flirt pole or while playing fetch, though it’s most commonly seen when playing tug. I love nosework. I’ve already written a whole blog post on playing nosework with your dog. Nosework is a great way to exhaust your dog. It takes a lot of work to find hidden treats with your nose! Dogs also feel calmer when they’re sniffing. Hunting for food with their nose is incredibly natural for them, and this game does wonders for calming stressed-out dogs. Use boxes with treats in them to teach your dog to look for treats using his nose. Gradually increase the complexity of the treat-in-box game by putting boxes in different configurations. This is really all you need to do to get started in nosework. If you’re really interested in nosework, check out my much longer blog on it to get started. This technique was developed by Grisha Stewart. It teaches the dog to yield to small amounts of pressure on the leash. Start inside, in a boring room, and have some treats ready. Clip the leash on the collar, and wait until things are calm. Apply a slight pressure on the leash to one side, and wait for your pup to yield a bit to that pressure. 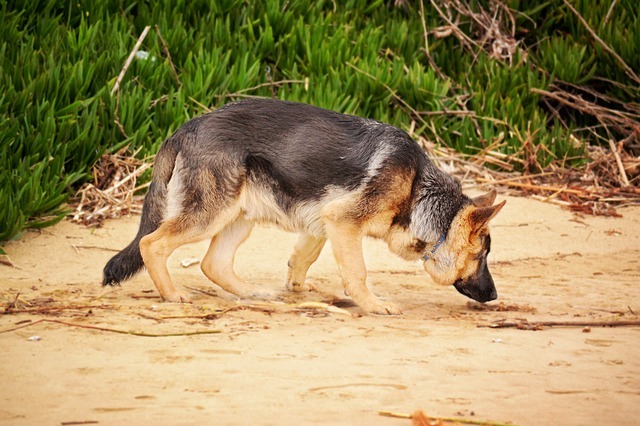 Your pup might actually move towards the leash pressure, or just shift his weight a bit. Take whatever you get! Mark the moment, and give a treat. Wash, rinse, and repeat until you can see the dog respond readily to very slight leash pressure while inside, then start working on it in a familiar place outside. Gradually increase the distractions while playing this game to teach your dog to follow you with feather-light leash pressure all around town.